This stunning lovely stone villa is located on a hill in Mlini, just 10-15 minutes driving distance from Dubrovnik Old Town and 5 minutes from the center of Mlini.It dates back to the 17th century but has been thoroughly renovated and with a generous 160m2 of interior space over three floors villa can comfortably accommodate up to 8 guests.Ground floor consist bedroom with king bed, full bathroom with bathtub and shower and day room with small kitchen.The main entrance first floor of the villa features a day living room, dining room, full kitchen, one bedroom with king beds and bathroom.On top level consist 2 bedrooms and has a beautiful sea view with en suite bathroom with bathtub. The highlight of the property is its outdoor space with a spacious terrace boasts an infinity swimming pool 8x5m, 8 sun loungers and park for kids.With sweeping views of the sea and the countryside, it is a perfect spot for lounging or entertaining. The villa is surrounded by a rich assortment of Mediterranean plants such as lemon, and olive trees which create a relaxing, peaceful setting.Amenities include air conditioning in all rooms, satellite TV, free WiFi, DVD player, stereo, coffee maker, ice-maker, dishwasher, washing machine, hairdryers, iron, ironing board, swimming pool, and free parking space. The center of Mlini can be reached in 5 minutes and has much to offer guests: pebble beaches, a waterfront promenade lined with shops, restaurants, & cafes, a port with frequent shuttle boat service to Dubrovnik and Cavtat, and some of the most spectacular natural scenery on the Dubrovnik Riviera. Dubrovnik's historic Old Town is a mere 10-15-minute drive away. The return trip involves a strenuous uphill climb. A rental car is recommended when staying at this property. We enjoy beautiful things - travel the world and expect the best, so we like to offer our guest the best when they stay at Villa Mlini. We are born in Dubrovnik and we would like you to offer you an authentic experience of our city Dubrovnik and Dubrovnik Riviera. Looking forward to see you soon and wish you an amazing holiday! Picture perfect sunset views over the Mlini bay. 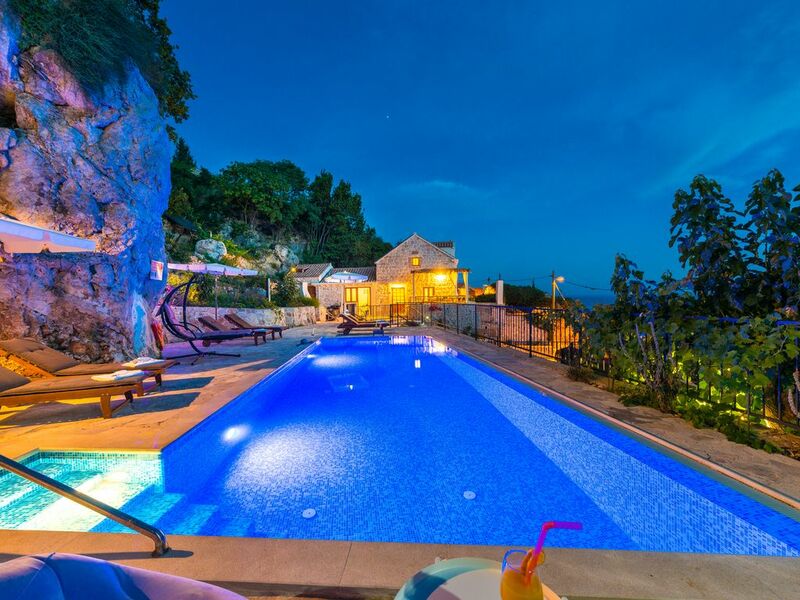 - Great location for the explore island and the Dubrovnik Riviera - Excellent food and wine in all area - Proximity to beaches and port of Dubrovnik.....great place for family and friends to recharge.The private pool is also very secluded and offers guests the opportunity to enjoy all the amenities of Villa Stone. We all had a great time, the kids especially who loved the toys, pool, slide and trampoline. Hosts were great, and we genuinely wished that we stayed another week. Perfect property, perfect location, perfect host! It is rare to find a place that not only meets your expectations but also far surpasses them. Villa Stone is such a place. Booking, communication and payment were all straight forward. Prior to our arrival, all of our questions were answered quickly and completely. Upon our arrival, we were met by the owner, Miho, nearby and escorted to Villa Stone. What a wonderful first impression! The villa was very clean and well appointed. The kitchen was stocked with basic necessities and then some including water, beer, wine, snacks, coffee and even homemade strudel. Miho took time to familiarize us with the property, the amenities, local information and some suggestions to make our time wonderful. After a toast, or two, of homemade liquor he departed and we began our vacation. Everything at Villa Stone worked, was clean and high quality. In addition, the rooms were very tastefully decorated, the beds comfortable and there was plenty of hot water. The pool was cleaned everyday, was gorgeous and very relaxing. The view from Villa Stone was breathtaking! You can see down to Mlini harbor, islands in the Adriatic and also the mountains leading inland to Bosnia-Herzegovina. A few days into our vacation, Miho took us for a sunset tour high into the mountains overlooking Cavtat and then down to an old mill complete with Roman Aquaducts. Fantastic! Croatia is a great country to visit! Friendly people, lots of natural beauty and a great deal of history. Villa Stone is in a prime location, not too far away from ferries, beaches, mountains, cities and also near enough to Montenegro and Bosnia-Herzegovina to do day trips. In summary, our group of six had a great time, ample room and were still commenting on what a wonderful place Villa Stone is and how attentive Miho was thoughout the trip. I strongly recommend you give it a try, I think you will have a great vacation! Beautiful Villa in beautiful location with lovely sea views. Everything about it was fantastic from the immaculate pool to the fully air-conditioned lovely rooms. We couldn’t have chosen better! Miho the owner is exceptional. He welcomed us to his villa with homemade drinks and nibbles and a well stocked fridge while giving us lots of recommendations for local restaurants and day trips to near by islands. Lokrum island is well worth a visit! We were blown away by his kindness and would not hesitate to recommend or return to this villa. We stayed in Villa Stone in August and it exceeded our expectations on all counts. From the moment we arrived Miho the owner made us feel very welcome with a great food and drink package whilst explaining the local sights and restaurants. The villa is furnished to a very high standard and has all the home comforts and more. Everything was immaculate, and the pool was the cleanest I have ever had in a villa. The extra touches that Miho provides make all the difference right down to the little treats he leaves throughout the week. The self-contained one-bedroom apartment was great, and the villa layout gave all our family plenty of personal space. This villa also has such an interesting history and blends the old and new together very well. All in all I would not hesitate to recommend or book this villa again. The villa was beautiful with a lovely pool area and everything we needed. Our host Miho was exceptional. We were provided with a wonderful welcome pack. He kept the pool very clean and on occasions he left us bottles of wine and home made cakes in the morning. The villa is very well equipped with several barbecues and briquettes and fire lighters provided.There were condiments provided dishwasher tablets and detergent. All the things you usually have to buy.Miho even took us shopping to the local supermarket on our first day to buy groceries. Mlini Bay is small but is a good base to go to other places such as Dubronik and Cavtat. You can get to both destinations by boat.They have wonderful ice cream in Croatia and very good wine. Irena organised day trips for us to Mostar and Korcula including a visit to a winery.We had an air conditioned 8 seater and a driver who spoke excellent English. We also visited a village called Ston with it's own "great wall" which was interesting. We didn't have a car and the walk down to Mlini Bay is steep with a lot of stairs and is a really difficult 20 minute walk back especially in the heat, it isn't for the faint hearted but Uber are in Croatia and we found them very convenient. Thank you Miho for a wonderful experience. Superb stay. Fabulous views. Very well equipped Villa. Gorgeous gardens and everything you need for a super relaxing holiday. The owner Miho is very attentive and his attention to his guests stay is above and beyond the call. We will be back. A visit to the Elafiti (or Elaphiti) islands could be the high point of your visit to Dubrovnik. EVENTS: daily visits to the location are allowed. CUISINE: oysters, mussels, fish, wine, olives. The town center is a maze of cobbled streets full of small restaurants with some of the freshest seafood in Croatia. The area is especially famous for its oysters and other shellfish. Your guide will show you around town and walk with you along a portion of the wall. You then have the option of stopping for lunch to try some of Ston’s famous seafood. CUISINE: fish, olives, wine (Dingach and Postup). The Peljesac peninsula is known for its rugged terrain which provides great conditions for grape growing. It is these conditions combined with centuries of skill and tradition that help to create the region’s wines, which are among the best in Croatia. EVENTS: Apparition Anniversary, Youth FestCUISINE: lamb, grilled dishes, wine, brandy. Please, contact us and make a reservation to visit these marvelous places!